Best-Rated OLED TVs -Comparison & Reviews: This page contains a roundup of the highest rated OLED 4K Ultra HD TVs, presented here for a comparison of price, features, and reviews. OLED TVs use an emissive technology to produce light, so there is no backlight. OLED TVs produce the darkest blacks of any screen technology, since each pixel can turn off completely. OLED TVs also have a super fast refresh rate, much faster than LED TVs. Viewing angles for OLED TVs are also excellent, exceeding other technologies. OLED is currently the best screen technology available. LG and Sony’s newest OLED TVs have HDR with Dolby Vision for better Dynamic Range, more vivid colors, and better, deeper blacks. All OLED TVs are 4K, which means you are getting 4x the resolution of HD, or movie theater resolution. Below is a comparison of the current available OLED 4K TVs, with major features, and reviews for models in each series. 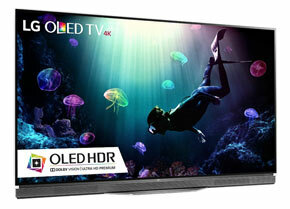 OLED Screen Technology = LG is the leader in OLED TVs, and with Sony only one of two manufacturers of OLED TVs. OLED TVs use emissive technology (no back light), that have very fast refresh rates. They give the best quality picture, colors, and contrast levels of all the screen technologies available All of LG’s OLED lineup is 4K Ultra HD. HDR & Dolby Vision = LG and Sony OLED TVs for 2018-2019 have High Dynamic Range (HDR) technology and Dolby Vision. These technologies allow a picture with a much wider range from bright to dark, more vivid colors and shadow details. This is a major upgrade in picture quality aside from resolution. The new 4k Bluray discs and future streaming and cable content will be tailored for HDR to take advantage of this technology. Image Processors = While most people look at the screen technology, the image processor is very important for picture quality, especially for upscaling lower resolution video. The more powerful chip, the better the picture. LG for instance has an Alpha 7 chip, and the newer Alpha 9 chip. There is a sizable difference in picture quality with the Alpha 9 vs. Alpha 7 chip. Some of the 2019 LGs Tvs have the latest Alpha 9 (Generation 2) chip. Processing gets better and better with each year. HFR (High Frame Rate) = LG OLED TVs with an Alpha 9 chip or above will support HFR (High Frame Rate), up to 120 frames/second for smooth and fluid video even during fast motion (such as sports, action movies and games). This is similar to 120Hz TVs on TVs with LED displays. HEVC (H.265) codec = HEVC (H.265) is a new compression codec that is used to compress video. This new codec compresses twice as much data as previous codecs, so that 4K Ultra HD video can be sent over cable and the internet. HEVC (H.265) will allow 4K/60p playback for viewing 4K sports in the future. 4K/60p will also be available on future 4K camcorders. All of LG’s 4K Lineup have a HEVC decoder installed. Netflix 4K Content is currently streamed using this HEVC decoder. What native 4K Content is Available Today? = Currently, Youtube, Amazon and Netflix are streaming 4K content to consumers. ESPN, Comcast Xfinity, and others have announced that they too will have 4K content. 4K Blu-Ray Players with HDR are now available. Quad Core Processor = All of LG’s 4K Ultra HD Lineup will have a Quad Core Processor. This will greatly increase the functionality and speed of their Smart TV Functions, and internet connectivity. Pixel Contrast Booster = On the Sony Master Series A9F Series TVs, enhances the color contrast in high-luminance scenes. Acoustic Surface (Actuator+Subwoofer) = On the Sony A8F and A9F OLED TVs, Acoustic Surface techology is used with two actuaters & subwoofer. Most TV speakers fire downward, while Acoustic Surface sound comes from the entire screen, for a more immersive experience. Netflix Optimized = Netflix uses Sony A9F Master Series 4K OLED TVs to optimize their content. There is a special Netflix Calibrated Mode, when using the Netflix APP, to display video as the filmmakers intended. WebOS 4.0 = This is LG’s latest Smart TV interface for 2018-2019. Easier to use with the new Smart Magic Remote. Mastered in 4K Blu-ray Discs = To accommodate the new 4K TVs, new blu-ray discs have been introduced that were mastered in 4K to give you the best picture on your 4K TV from a blu-ray disc. They are recorded with higher bit rates for better picture quality. These discs can be played by blu-ray players and Playstation 3 and 4 players onto your 4K Television. Genuine native 4K Blu-ray players with HDR are now available. LG’s SmartShare All LG 4K TVs have LG’s Smart Share installed, which allows you to transmit video, pictures, or music from your smartphone or tablet to your TV. LG uses WiFi Direct which requires no Wifi network. You simply get the free App and install it on your smartphone or tablet. Miracast™ Screen Mirroring = On Sony OLED TVs, you can send multimedia content from your Miracast enabled smartphone or tablet to your TV. Viewing Angles = An OLED panel gives you a wider viewing angle without losing contrast than standard LED panels. HDMI = HDMI inputs allow you to connect devices to your HDTV such as DVD and Blu-ray players and game consoles. HDMI 2.0 is one of the latest 4K Television standard, which increases bandwidth to 18gbps, allowing higher framerates, more audio channels, Full resolution 4K 3D. Smart TV/Internet Ready = An internet ready TV allows you to connect an ethernet cable or a Wifi wireless connection to your TV. Content can include services such as Netflix, Youtube, Amazon Prime, Facebook, and other content. Services vary by manufacturer and model.